Diabetes is the 3rd leading cause of blindness. With a cooperative effort between you and our doctors we can greatly reduce this risk. There are some important things we want you to know about diabetes and the eyes if you have diabetes yourself, are at risk for developing diabetes, or want information because you are concerned about someone who has diabetes. Our bodies need to break down sugars from our food intake to obtain energy. Diabetes is a malfunction in this process. The problem has to do with poor or absent ability to make insulin which is needed for this process. Diabetes is a chronic disease. It takes a toll over time particularly on the smaller blood vessels of the body and the tissues and organs they supply. 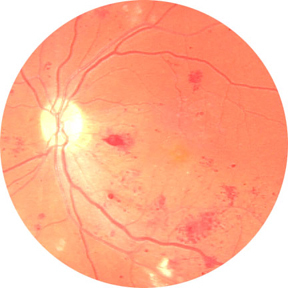 This decreased integrity and function of the small blood vessels tends to show up in some characteristic ways. It is the reason that diabetics heal poorly. Poor circulation in the extremities, especially the feet, can lead to severe infection that does not respond to treatment and may require amputation. Because they depend so much upon small blood vessels for nourishment, the eyes and the kidneys seem to be target organs where diabetes commonly causes significant problems. When the kidneys cease to function (renal failure), the patient may have to go on a dialysis machine to flush out the toxins that build up in the blood without working kidneys. Concerning the eyes, the worst problem is blindness as a result of diabetic retinopathy (more on this later). The problems mentioned above are very serious. They usually develop after ten years or more from the initial diagnosis of diabetes. They are not at all rare — in fact, they are common with diabetes. They are often preventable. It is important to understand that diabetes must be managed now in order to reduce the risk of the severe complications down the road. Without question, if we put aside the rare exception to the rule, diabetics who do not follow the recommendations of their healthcare providers have a much greater rate of complications. There will be those who make every effort to manage the disease and still have problems but even they are better off than if they weren’t making the effort. At our office we see hundreds of diabetics every year. About 5-10 times a year we see a patients who thought they were completely healthy and felt fine that come in because they’ve had a sudden, dramatic change in vision. Almost overnight the vision becomes very blurry. When questioned, these patients often also have the hallmark symptoms of the onset of diabetes — excessive thirst, frequent urination, and weight change. They are referred immediately to their primary care physician for testing their blood sugar which almost invariably comes back 500 mg/dl or greater (sky high). The change in vision has occurred because the blood sugar has reached such a high level that the lens inside the eye swells and changes the vision. As things stabilize under the care of the family doctor the blood sugar comes down, the swelling goes away, and the vision returns to normal.